The St. Louis area has more tournaments available than people tend to realize. Just look at the list below! There are weekly and monthly events mixed in with one-time events, so look carefully before deciding which to attend. Questions about event details and eligibility should be directed to the tournament director listed or the host location indicated. If you know of a tournament not listed here, please let us know. Showing 10 of 10 events, use the search form to narrow results. 9 Ball tournament this Tuesday, 6/13, on 7' DIAMOND Tables, at The Crowbar in Overland. Open to everyone! $10 entry. Sign up at 6:30. Play at 7:00. $10 entry (House adds 25%). Qualify for final tournament! Double elimination, Just $0.25 per match! 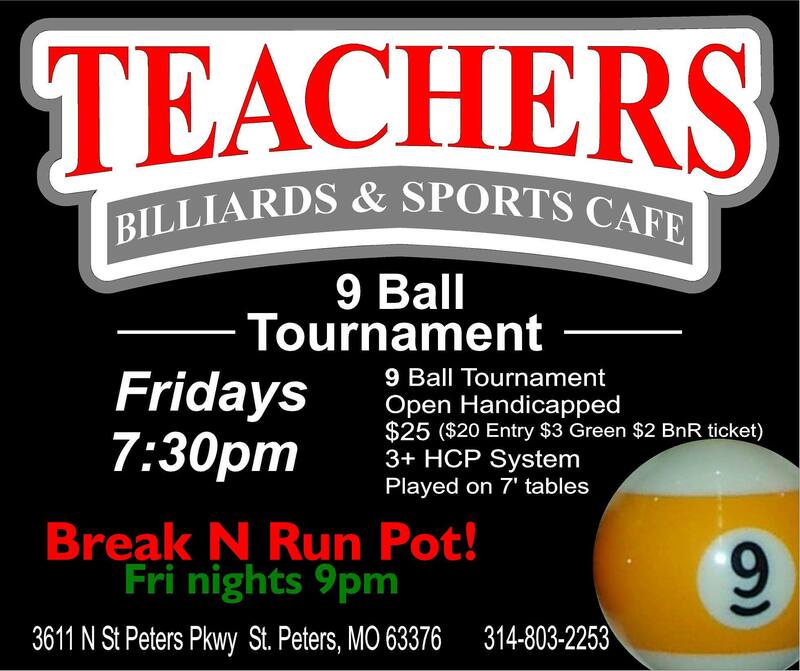 Hosted by Rick Peters, call 314.406.0702 to sign up early. Food and Drink specials for Players. Handicaps based on MO8 ratings. $25 entry includes $3 green fees and $2 Break'n'Run ticket. +3 Handicap system. Diamond 7' tables, cyclops balls. Open to all players. Break'n'Run Pot Raffle at 9pm. $25 entry includes $5 green fees. +3 Handicap system. Diamond 7' tables, cyclops balls. Open to all players. Sunday nights. Race to 4. $10 entry. House adds $50 for every 8 players. $25 Entry, Split Quarters, Handicap max per team: 10. 9 Ball counts on snap! Bar adds $250 with more than 16 teams!